Bubo blakistoni, is an owl. This species is a part of the family known as typical owls, Strigidae, which contains most species of owl. Blakiston's Fish Owl and three related species were previously placed in the genus Ketupa; mtDNA cytochrome b sequence data is equivocal on which genus name is applied for this species (Olsen et al. 2002). This owl is a resident breeder in Russia, China, Japan, and possibly North Korea. Its habitat is riparian forest, with large, old trees for nest-sites, near lakes, rivers, springs and shoals which don't freeze in winter. It feeds on a variety of aquatic prey, including fish and amphibians, but also takes mammals and birds. 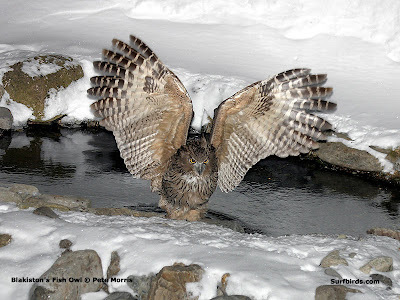 Blakiston's Fish Owl is a massive (60-72cm) owl. The upperparts are buff-brown and heavily streaked. The underparts are pale buffish-brown. The throat is white. The iris is orange-yellow, and it has long, broad, horizontal ear-tufts. Sexes are similar, with females notably larger. The call varies by subspecies; in some places the call is a short, deep boo-bo-voo or a shoo-boo. This bird is endangered due to the widespread loss of riverine forest, increasing development along rivers and dam construction. The current population in Japan is approximately 100 birds (20 breeding pairs and unpaired individuals), whereas on mainland Asia the population is much higher, perhaps several thousand individuals. Henry Seebohm named this bird after the English naturalist Thomas Blakiston, who collected the original specimen in Hakodate on Hokkaidō, Japan in 1883.